Zechar Bailey Funeral Home donated to Brethren Retirement Community’s Capital Campaign. 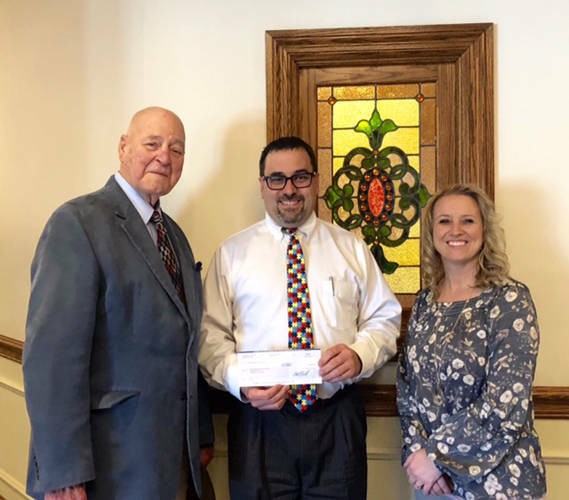 Pictured (l-r) are Fred Bernhard, chairman of the BRC board and campaign co-chair; Greg Zechar, manager of Zechar Bailey Funeral Home; and Holly Hill, chief marketing officer at Brethren Retirement Community. GREENVILLE – Brethren Retirement Community accepted a donation from Zechar Bailey Funeral Home for its ongoing Capital Campaign. Some of the projects that will be accomplished as a result of this project include renovation of the Rosewood Health Center and Brethren Retirement Community’s “Second & Main” project, which will include an enlarged Senior Fit Gym, a theater, ice cream parlor, computer center, family visitation room and resale shop.